Table For Three, Please. » Adam’s Seriously Good Ice Cream. Seriously. Adam’s Seriously Good Ice Cream. Seriously. I randomly met Adam Lieber last year in Coron, through common friends. I learned that he had opened a new restaurant at the Fort and I quickly paid him a visit. It wouldn’t be a fair to give a review after a single visit to his restaurant, Rose, but I distinctly remember Adam serving our table a sampling of his ice creams and sorbets. Adam told us that he’s been making ice cream as a hobby for many years and he just added the ice cream to his menu for the lack of dessert options. Thanks to endless hours on the internet, I caught a glimpse of a page called Adam’s Ice Cream and was pleased to see Adam churning up new flavors. We exchanged a few messages and he invited me to visit him at the restaurant. I brought D with me since she’s a big ice cream fan. Boy, were we in for a treat. Adam was so excited about the new flavors he created, he made us sample the entire menu, except for the Minty Pineapple sorbet. He said that mint is difficult to find now due to heavy rains. Adam strategically served the ice cream in batches, making sure we don’t go too crazy from the tasting. Don Ricardo’s Choice: This is made with Beronia Mazuelo Reserva with Spanish goat’s cheese. Not quite sure what to expect since I wasn’t sure if the sour notes came from the wine or the goat’s cheese. 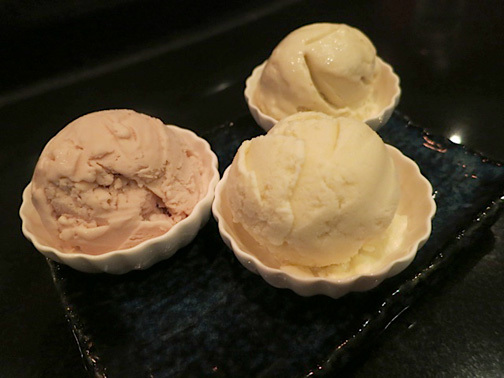 Wasabi: Very interesting flavor, got grated bits of fresh Japanese wasabi but worked so well in ice cream form. A great alternative for green tea fans. Figgy Blue: The taste of the Italian blue cheese is there but it’s a subtle spoonful and a great pair with the honey soaked figs. The combination works so well in ice cream form, reminds me of a dessert I had in a French restaurant. 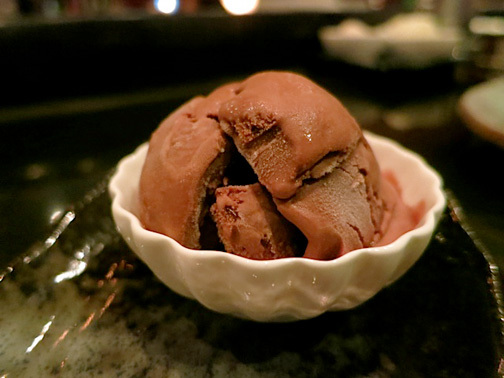 The First Lady’s Fantasy: An ice cream created for a former First Lady who loves her shoes, it’s a rich combination of dark and milk chocolate sweetened by honey and coco sugar. This is a surprise hit for me, since this is offered to diabetics for it’s low glycemic index. If some of you out there remember Cookie Monster’s Chocolate Cake from Crossroad Arcade, this is just like it! 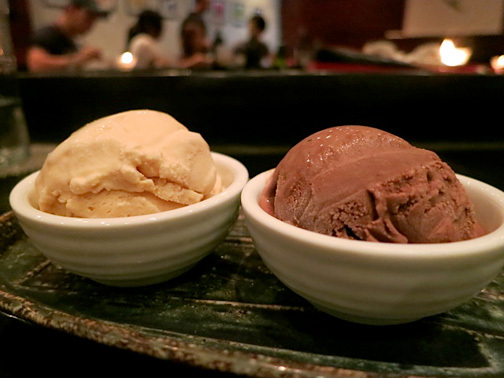 If you’re a fan of Asian cuisine, these two flavors are prepared beautifully. Quite unique, since both have ginger yet are distinctly different. If you’re looking for something new, these flavors are sure to entice your palate. These two are a match made in heaven. Adam calls this combination The Danish Couple, named after some visiting honeymooners who found their way to Rose. We can only imagine how those two ate but the delicate Himalayan Salted Caramel and spicy Chocolate Flame really go so well together. Baklava: This is actually the first flavor that caught my eye on the menu. I love the Baklava pastry so much and this tastes exactly like it. It’s sweet, nutty and packs a lot of cinnamon and spice. Some spoonfuls of this ice cream reminds me of milk and cereal, too. Green Tea Kit Kat: If you’re a big fan of the chocolate bar, this is sure to hit the spot. I love the crunch from the Kit Kat bits. The Infanta’s Favorite: This is a rich flavor that tastes like a Spanish custard, mixed with hazelnuts. Surprisingly, this struck me as too rich, despite my high tolerance for decadent dishes. Great for hazelnut fans. The Ambassador’s Butter Cream: Adam gave us a sample of this scoop last year, this is one of the flavors that made his ice cream so popular. It’s brown butter cream with homemade brittle. If you’re not sure which flavor to try, this is highly recommended. So there you go, D and I ate a dozen ice cream flavors and loved every bit of it. Adam takes pride in using the best ingredients he can find, he says he uses French cream for his ice cream. I know there are a lot of artisanal ice cream makers in the market today, but Adam’s is worth giving a shot. You won’t be disappointed. Which flavor was your ultimate favorite? I really liked the salted caramel and the ambassador's butter cream :) The Baklava flavor sounds awesome!!! It's hard to choose which one is the best but I'd say the Ambassador's Butter Cream is the winner. I loved the Wasabi, too! I'm finally going to get to try Adam's Ice Cream this week and I am so excited !!! I love the Bluecheese IceCream, so rich and creamy. Thanks everyone for the kind words. Yes, the Figgy Blue is quickly becoming a best seller! Wanted to let interested and sophisticated taste buds know that we will have a tasting event tomorrow night at ROSE - ALL 15 flavors (including 3 brand new ones making their debut) for P695! Oh and please make a reservation if you'd like to come (Adamsicecream@gmail.com or 09175972573), limited to 20 pax.